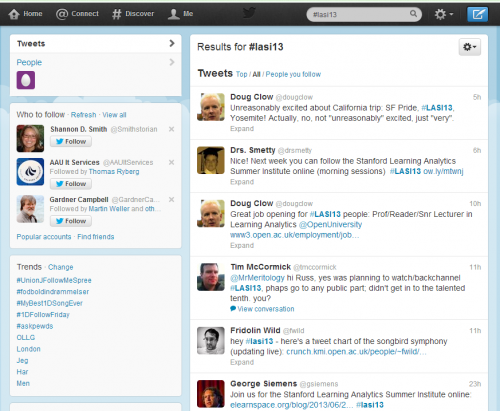 In this assignment you must participate in the Twitter threads and conversations going on around the Learning Analytics field and the LASI events. You can do that by following some of the relevant # before and during the LASI online sessions. To pass this assignment you should write at least 10 tweets/retweets and find some relevant people and organisations to follow. 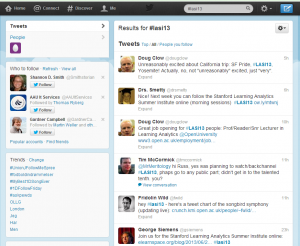 You must insert a photo/graphic of something going on in the lasi13 in two of your tweets. We will use the Twitter threads in data analysis in the workshop on Wednesday and Thursday. Several of the participants joining LASI-Aalborg have very little experience in using Twitter so we will use #lasiaalborg partly as an opportunity for practice. Everybody is of course welcome to join in.